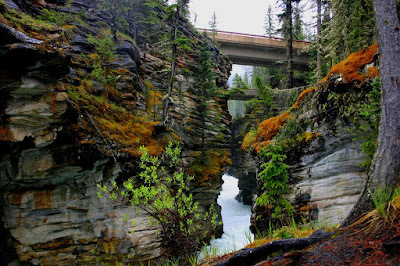 The drive from the town of Banff to the town of Jasper is 200 miles of one of the most beautiful drives in the world. We know this from our prior visits to these two great Parks. 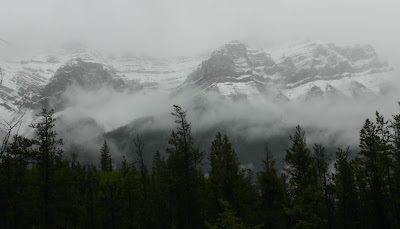 It is a good thing we already knew it, because our trip from Banff to Jasper this time was rain or snow showers the whole way and the beautiful peaks and spectacular views were covered in clouds and fog. As our stay in Jasper continued it rained part of everyday and the clouds have never lifted to get a good view of the towering peaks that surround us. 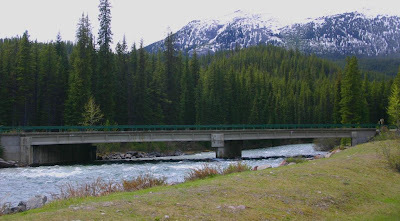 The Athabasca River starts at the Columbia Icefield, heads north for about 80 miles through Jasper and then travels thousands of miles to the Arctic Ocean. Here in the park it is about 100 yards wide in most places. 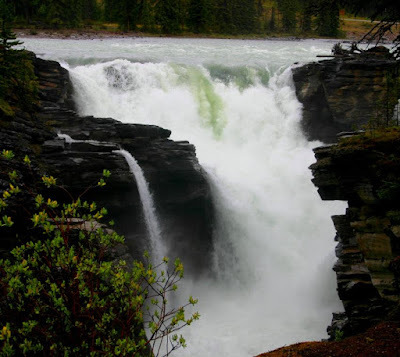 At Athabasca Falls the entire 100 yard wide river is squeezed into a 20 foot wide water fall and then into a 10 foot wide gorge before exploding out to a 100 yard wide river again. It is amazing sight. On our trip up to the falls we had intermittent rain. On Sunday we joined a local birding group for a bird walk to a local birding hot spot. Seventeen people showed up for the walk which is really too many. There weren’t really a lot of birds, but we did pickup a few birds for the year list (Alder Flycatcher, Wilson’s Warbler and Golden-crowned Kinglet). About a third of the way through the walk our local host said that we should head back to the cars as it was going to rain again. No sooner had we started back, the rain came down hard adding more water to the already muddy and flooded trails. Our birding information said that we could find Harlequin Ducks and American Dippers at Maligne Lake and along the Maligne River. 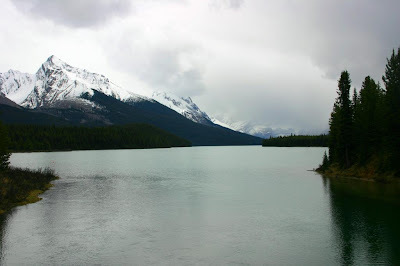 As we drove out that way we had a mix of rain and sleet, but the sun came out as we arrived at Maligne Lake. As soon as we walked across the bridge, where Maligne River flows out of Meligne Lake, our first bird sighting was an American Dipper and our second bird was a Harlequin Duck. The duck would fly under the bridge up stream and then float in the current back down stream. The American Dipper kept flying back a forth under the bridge probably feeding young in the nest. We stopped at a picnic spot along the river on our way back down the canyon and this little patch of willows had 3 kinds of warblers, a flycatcher and Chipping Sparrow. While there we also saw a juvenile Bald Eagle and our first Cedar Waxwings of the year. The year bird list is up to 194. 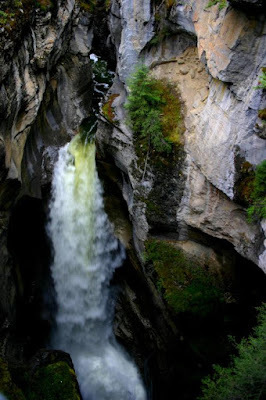 At Maligne Canyon the Maligne Rivers enters a series of very narrow fissures some as little as 2 feet across and a series of waterfalls the tallest being over 120 feet. At the end of the parking lot you can take 2 trails along the canyon. The trail we took was down to the middle falls, which was down below the bridge about 70 feet. We only went to the fifth bridge and returned up the steep and muddy trail to take the trail that goes along the upper cascade. 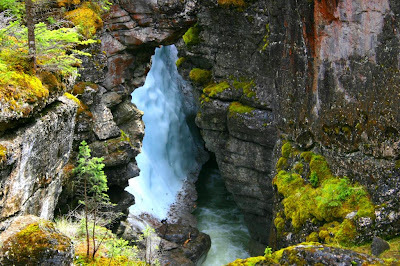 140 million years of the river carving the rock has left some awesome looking geology! It seems hard to imagine, but Jasper is even more thickly forested than Banff. 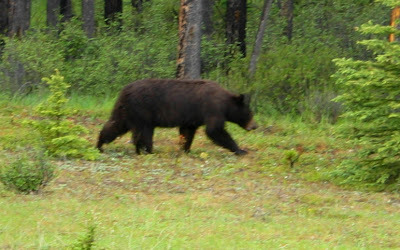 We haven’t seen as much wildlife as we did in Banff, but we have had both deer and Elk in the campground and we saw our first Black Bear of the year along the road about a mile from camp. Posted from the Jasper Alberta public library. Loved your pictures of the falls and the canyon. We never got anything nearly that nice when we were there. I have made your trip and love it. Williams Lake is as awesome birding spot along with Juneau at the Shrine of St Teresa and Mendenhall Glacier. A place not to miss is St. Lazaria, also know as Bird Island in Sitka. I have fished there several times and birding is outstanding. A great place to see Rhinoceros Auklets is to take a tour or "go fishing" out of Craig. The last time I was there a deer was swimming from one island to the other. Least Aukles can be seen on the Kenai Fjords Tours (take the long tour, much more interesting). I love birding in Alaska. ps: 10 K north or south of Meziadin Junction has never failed to give us black bears. The viewing platform in Hyder is great for watching waxwings, although I have seen more bears driving the roads especially towards Salmon Glacier. A couple more birding spots - Creamers Field, Fairbanks; Potter Marsh, Anchorage; Milepost 101.4 Talkeetna Cutoff to Trapper Creek - Trumpeter Swans; the drive from Haines Junction to Haines is a drive to almost compete with Top of the World highway. I will be checking in on your website all along. I will be in Juneau in two weeks staying on Douglas Island for a week. I am ready for a respit from this Texas heat.